Truly wireless headphones keep you from tripping over cables while you’re jamming to your workout playlist. 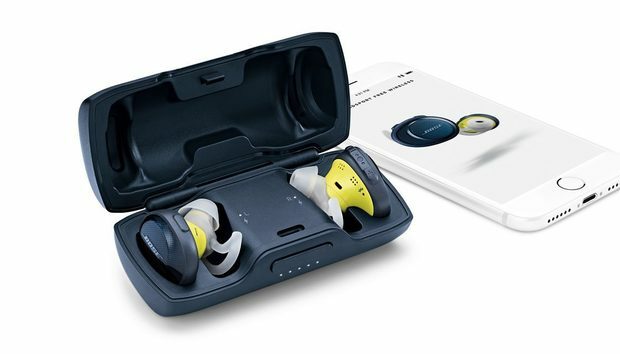 There are lots of options out there, but if you’re looking for top-of-the-line wireless earbuds designed for life in motion, you can’t get much better than Bose’s SoundSport Free sport headphones, our favorite true wireless earbuds for exercising. And you’re in luck – they’re on sale at Amazon for $179.10, the lowest we’ve seen them and down $70 from their normal listing of $249. We gave these earbuds 4.5 stars out of 5 for their reliable Bluetooth connectivity, great audio quality, and solid battery life – 5 hours on a full charge and 10 more hours with the included charging case. Bose’s buds put the wearer in charge of their listening experience with removable tips of different sizes and user-friendly controls. To ensure worry-free workout use, they’re also water resistant and connect to the Bose Connect App’s “Find My Buds,” so you can track them down if they get lost during your adventures. The SoundSport Free sport headphones are also designed to let you hear what’s going on around you, even when music is playing, to keep you safe while you’re jogging through the streets. Though these buds are typically more expensive than other truly wireless options, their performance makes them worth the investment, and this deal makes them much more affordable.